A VISITING CARD, also known as a calling card, is a small card with one's name printed on it, and often bearing an artistic design. In 18th century Europe, the footmen of aristocrats and royalty would deliver these first European visiting cards to the servants of their prospective hosts solemnly introducing the arrival of their owners. A CREDIT CARD is a payment card issued to users (cardholders) to enable the cardholder to pay a merchant for goods and services based on the cardholder's promise to the card issuer to pay them for the amounts so paid plus the other agreed charges. The card issuer (usually a bank) creates a revolving account and grants a line of credit to the cardholder, from which the cardholder can borrow money for payment to a merchant or as a cash advance. In other words, credit cards combine payment services with extensions of credit. Complex fee structures in the credit card industry may limit customers' ability to comparison shop, help ensure that the industry is not price-competitive and help maximize industry profits. Because of this, legislatures have regulated credit card fees. 9 Best Business Card Cases & Holders for 2018 - Best. The Business Card Holder Guide - Gentleman's Gazette. Top 10 Best Prestigious High-End Credit & Debit Cards - The International Man. Top 12 Best Business Card Holders For Men - Next Luxury. Top 25 High-End Business Card & Visiting Card Suppliers - The International Man. ACME STUDIO - men's & women's. All models. ACQUA DI PARMA - since 1916. "The excellence of Italian craftsmanship." ALDEN - since 1884. Folding Business Card Case. ALEXANDER MCQUEEN - Heroic Card Holder. Anna Walker London - men's & women's. A.P.C. - Italian grained leather card holder. 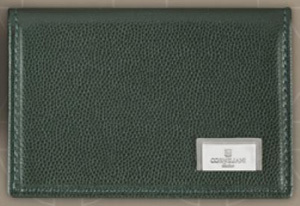 Aspinal of London - men's business card holders. ASPREY - "British Luxury Goods Since 1781." Asprey hallmarked sterling silver card case with Asprey's signature barley pattern. Atelier Renard - "Sellier à Paris." Paris-based perfumer Maison Francis Kurkdjian has collaborated with Brigitte Montaut, the designer and director of Atelier Renard, for a new line of fragranced leather pieces: a colorful and fun new line of leather goods, the 'Twin-Set' cardholder pieces. The line features Mississippi alligator leather, lambskin and calfskin, all tanned in France and dyed into stunning colors. BALLY - men's & women's card holders. Bianca Mosca - since 1946. Bespoke alligator card holders. 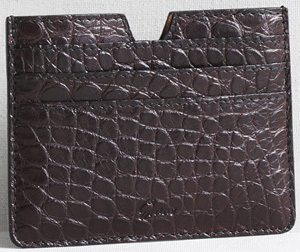 Billy Reid - men's alligator card wallet. BREMONT - leather business card holder. 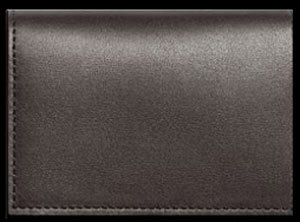 BROOKS BROTHERS - men's card case. Bugatchi - since 1981. Men's & women's. 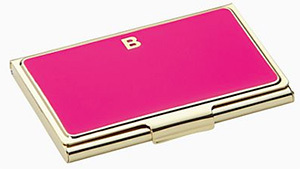 Bulgari - business card holder. Caran d'Ache - men's & women's business card holders. CARTIER - Business card holder with milleraies decor. CARTIER - Must de Cartier business card holder. 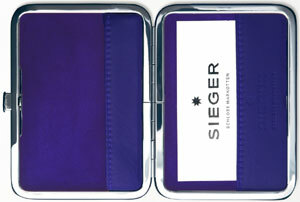 Cedes Milano - men's & women's business card and credit card holders. CROSS - men's card case. Cuyana - men's folding cardholder. 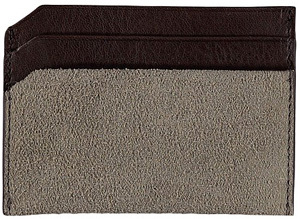 Dagne Dover - men's & women's card case. DAVIDOFF - men's credit card holders. 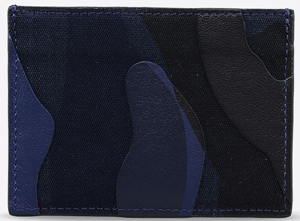 DIOR - men's card holders. DIOR - women's card holders. 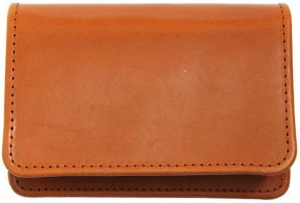 DUCHAMP LONDON - men's card case. EDWARD ARMAH - men's designer wallets. ELIE BLEU Paris - since 1976. Crocodile credit card holders. Éstie - men's card cases. Ettinger - cardholder by Monocle. 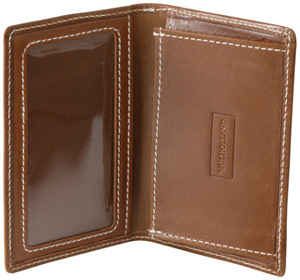 FARBOD BARSUM - men's pocket 5-card case. 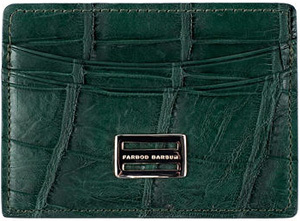 FARBOD BARSUM - men's & women's business card cases. Fort Belvedere - men's & women's business card cases. 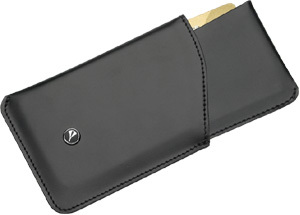 GEORG JENSEN - men's cardholders. GRENSON - since 1866. Men's & Women's cardholders. Gucci - card cases: all models. 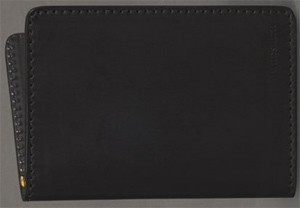 HOLLAND & HOLLAND - black leather business card case. Horizn Studios - men's & women's. JEAN ROUSSEAU - business card holders. 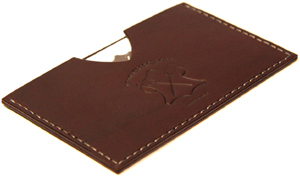 Jimmie William - "Perfect for a travel card, business cards or to use as a small wallet." Men's. JIMMY CHOO -business card holders. J.M. WESTON - men's business card holder. Judith Leiber - bespoke monogram business card holder. LORO PIANA - since 1924. LOTUS - carbon desk card holder. LOTUS - leather double card holder. LOUIS VUITTON - men's card holders. All models. MAISON KITSUNÉ - men's & women's. Malton & Kielman - "Bespoke bags and accessories." Men's & women's. 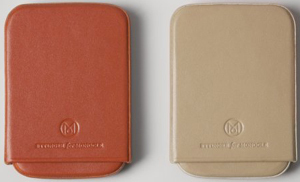 MONDAINE - men's & women's card holders. Montblanc - business card holder. 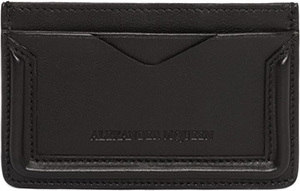 MULHOLLAND - men's business card cases & wallet. Noble & Graff - men's & women's. "Handmade in England." OLIVER Spencer - men's business card holder. Patrick Bateman Business Card Holder - Firebox. Philip Kydd - Silver Credit/Business Card Holder. PINEIDER - desk business card holders & business card holders with flap. PURISME - carbon card case. RALPH LAUREN - card case. ROLAND ITEN - men's & women's RCD 81 Mark I mechanically performing credit card dispenser. 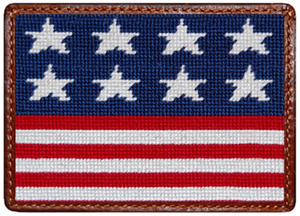 Issued in limited edition and numbered series. Salvatore Ferragamo - business card holder. 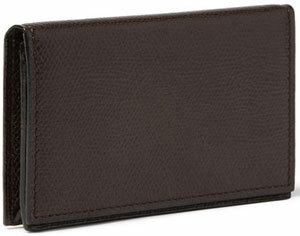 Sandro - men's cardholder in Saffiano leather. SMATHERS & BRANSON - needlepoint card wallets. S.T. DUPONT - business card holder. 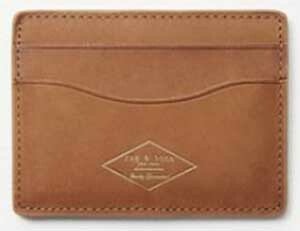 Stow - "Leather Card Holder for Him." SWAINE ADENEY BRIGG - "250 Years' of British Craftsmanship." Bespoke & Personalisation. TIFFANY & CO. - business card case. American Psycho 'style' card case. TOD'S - Made in Italy since 1920. Men's business cardholders. TOD'S - Made in Italy since 1920. Women's cardholders. Tony Perotti - men's & women's. 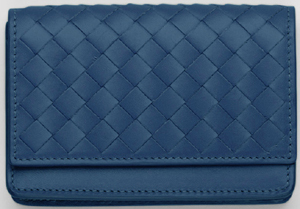 TORY BURCH - women's card case. 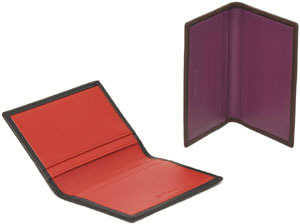 TUMI - men's & women's card cases. TYLER & TYLER - men's & women's card holders. UDESHI - men's & women's card holders. Undandy - "Conspicuously Unconspicuous." Men's & women's leather cardholder. WATERFORD - founded in 1783. 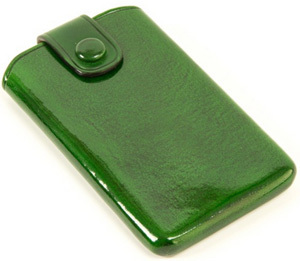 Crystal Lismore Essence Business Card Holder. Wildsmith - since 1847. Handmade in England. Card holder. YVES SAINT LAURENT - men's card cases. YVES SAINT LAURENT - women's card cases.